Government is experiencing challenges in collecting the revenues required for public service departments to function properly, Financial Secretary, Glenroy Forbes has said. 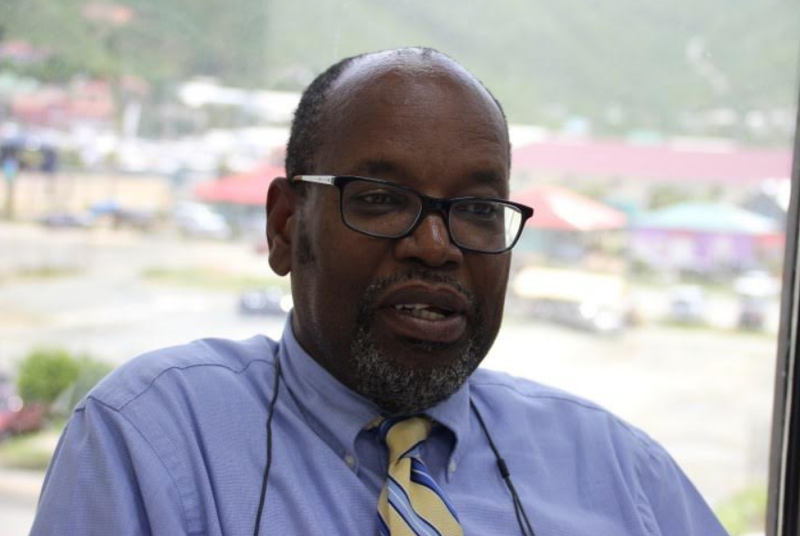 He told BVI News in an exclusive interview on Tuesday (July 24) that the challenges hinge on the territory still reeling from the impacts of the 2017 disasters. “Things are quite different than they were prior to Irma because, in most cases, you had money left over from the previous year and people could just go and spend money quicker,” he explained. Forbes said government “basically exhausted all of the monies that were available” after the hurricanes. While describing the extent of the territory’s economic challenges, Forbes said whenever Premier and Minister of Finance Dr D Orlando Smith announces government’s projected revenue for any period, the various governmental departments must then go out and retrieve the projected revenue amounts owed. The financial secretary’s statements come amid chatter that government departments are unable to function normally because the public purse is virtually empty. Forbes also told BVI News that government is operating with a budgetary deficit, which he projects will continue for the next three years. He, however, said government’s financial standing is likely to improve after those three years. “When the final analysis [of the economy] is done, I know we are going to see a deficit for last year, and we are going to have one this year too, and in 2020,” Forbes said. A deficit effectively means the money spent is more than what was received. Boy i wish we had that high school wall money, plane money and overspent cruise pier money now sah! Here we are. We don’t know how to collect the money and we clearly don’t know how to properly spend the money. (NDP’s $7milliioon airplane loss, no water, no electricity, slow internet, no schools, not even a working dump!) Lordy help us. Perhaps if the labour department was more efficient in granting permits and less rude, the trade department more efficient in issuing licenses, the immigration department less rude and officious, and we abandoned the ridiculous alien landholding legislation – GOVT revenues would go up. Imagine how much stamp duty would be paid if real estate was freely capable of being sold. We also have far too many civil servants – they are overpaid and many are not civil and seem to forget that their function is to serve the public. It would help if we dropped the word ‘officer’ in immigration and Labour – the staff are employees not officers. The answers are obvious but I am not confident we will accept them. You forgot to change your name to pat your own self on the back! LOL!! YIIING! The NDP and VIP killed this country. Please don’t elect any of them because the political coin is dirty on both sides. We need a Donald Trump like person. The old boy politics STINK! The government workers could try and work a bit faster in all departments. Would mean more transactions in a day, would mean quicker money in the pocket of the government. Or do we all seriously think they work at maximum efficiency already? Agreed, there is so much revenue to be raised which people are willing and able to pay if they will just process it. labour – $10k a pop, how much time does it really take to consider a renewal of a long time person here not changing jobs. 15mins? Badabing. traffic – enforce policies, don’t just leave it up to supacop. introduce a graduated payroll tax where higher earners pay more (eg pay 25% on earnings over $100k). ensure that the richest property owners are actually contributing – eg how much does Dicky B pay in property tax for his islands? Or Jarecki? Or Google man. Also, give us the actual figures – how much is genuinely down in revenue (given that most of it walks in the door through VIRRGIN without the government doing a ting) and how much of it is exceptional costs. How much borrowing has been done using the UK’s $300m loan guarantee? At times like this it would be really nice if the government ever decided to have audited accounts. To be fair, Government was not very good at collecting money before the hurricanes either. It just didn’t matter that much because they ran a comfortable surplus. Problems which were allowed to continue for years come back to bite you when things suddenly get tough. The “No Direction Party” has been banrkrupt financially, morally and strategically for the past few years – even some new younger representatives have failed to reverse the decline and nobody really trusts them now….desperate attempts to conceal secretive deals with contractors is probably the worst political own goal I’ve known – as a lawyer he should have known better – but too late now….at least people witness his agenda of opposition to accountability and good governance….. I always knew that he will eventually put his foot in his mouth. He have this sense of ENTITLEMENT as if everything is owed to him. His head has swollen with power and he feels like he is a know it all because of his legal status but he is dead wrong. He knows now that people are upset with his hunger for power. Humble yourself Mr. Cause even on the talk shows they don’t want to recognize him as Honorable. Sounds more like kids in school than a government ORG. Hey, you have a budget that has a bottom line for spending! That means you can’t spend MORE than you take in! Yes, that is the real world we live in.You also need a reserve fund for those emergency situations. This is basic 101 finance and Forbes should know this instead of trying to make excuses of not having enough of your hard earned money….Maybe you all need a new CFO ! Maybe it’s time to reduce staff and/or eliminate some of the useless and outdated public service departments. For example the BVI Post Office, the Library staff(2+ yrs. and no library), some of the BVI Port Authority staff, etc. I’m sure there are other public service departments that could reduce their staff yet still efficiently provide their respective service to the public. How about, in the future, NOT SPENDING THE RESERVE FUND. i.e. reserve it for when it is needed. Oh Gosh. lets look at some numbers real quick. Annual Budget used to be 300 mil, with annual income of about 300 mil. Now, revenues are down at least 50 per cent, maybe more. So, maybe 150 mil in collectable revenue, but collections are down, so probably 100 mil MIGHT be collected this year. And how many government employees? Lets say 4,000. At an average salary of 30,000 per year. That 120 million. In salaries alone. That is JUST the PAYROLL. And a billion is needed for reconstruction, that is a thousand millions. That is what we are looking at. Some Real Hard Times ahead. If our budget was 300 mill, all 300 mill cannot be income. Only about half of that would be income. The total figure is made up of spending and revenue (Liabilities and Assets). The public truly needs to be better educated. When you spend more than you bring in, that’s what creates a deficit. Mr. Forbes, how about submitting a balance budget? Where will the money for the deficit spending come from? The projected deficit for calendar year 2018 is $54M; where will the money come from? Will government have to borrow to meet budget, adding to the national debt? To meet budget, should government not be looking at cutting expenses, if it cannot generate the revenue? Government should be looking at some structural adjustments, some vertical and horizontal cuts……etc. What revenues government are not collecting, ie, custom duties, fees, fines ……etc? Is the challenge lack of staff, lack of equipment (computer…..etc), residents slow in paying or not paying at all, lack of facilities, inability to properly bill, inefficiency in collecting, lack of internal and management control……etc. Has all the unreserved funded been exhausted all ready? When can we expect the certified financial audits for the last 5-6 years? Will they be released before the election and if no why not? The money for the deficit they said would be from the windfalls that the Pier Park was gonna bring in! Remember we OVER spent on that (and others) project and the revenues have not materialized. All the pork barrel spending by this administration has left a very sour taste in most people’s moiths save for the few connected cronies. I’d rather would’ve liked to hear some solutions from you Mr.Forbes! But as we head into another election cycle the spin and perception management will reach fever pitch. this would be a good time for independence? The BVI is not ready for independence; it can look at self-determination but independence is not a good option resulting from the self-determination. If there were a slight hope for independence, the poor post hurricanes Irma and Maria response should have poured cold water on it. The beneficial ownership register imposed by the UK on Caribbean Overseas Territories (OT) has increased the discussion on independence. A number of bloggers and commentators have expressed a myriad of views on independence. If nothing else a discussion should be initiated. Son of the soil is being Sarcastic silly people. Gosh, you all are so slow…. How does Social Security value the loans it has been making to public entities? At par, or does it write them down to reflect that this is the government just spending the social security pot on the never never. PPL IN CARIBBEAN DONT GET SARCASM..RIGHT OVER THR HEAD.